The Games of the XXIX Olympiad began in Beijing on a hazy 8 August this year, an auspicious date for the Chinese from a numerology standpoint. A date can’t get much more lucky than 8/8/08, and, discounting the opacity of the sky, the Opening Ceremonies went off without a hitch at the new National Stadium. Aptly nicknamed the Bird’s Nest for its cross-hatched structure, the National Stadium was designed for a capacity crowd of 91,000 (11,000 of those in temporary seats) by Swiss architects Herzog & DeMeuron, in conjunction with the China Architecture Design Institute. On 8 August the National Stadium hosted a oncein- a-lifetime spectacle witnessed by Chinese citizens, world leaders and other visitors, and an estimated 1 billion TV viewers around the globe. Beijing’s ‘Bird’s Nest’ National Stadium during rehearsals for the Opening Ceremony. that all their hard work would pay off, and that, at least from a systems standpoint, the Games would progress without a hitch. While the opening pageant showcased the host country, the temporary loudspeaker system installed for the raucous Opening Ceremony relied on imports: a mix of JBL Vertec and Meyer Sound speakers. Soundcraft Vi6 consoles ran the stadium’s sound for the event. The permanent speaker system for the Bird’s Nest, on the other hand, was provided by Chinese manufacturer LAX, with a control system for the speakers also by LAX. This system provided audio to the spectators at the track and field events and the football finals. For the massive power needs of the stadium, over 400 Crown IT4000 I-Tech amplifiers are housed in 30 equipment racks in two rooms within the arena. China Broadcast Bureau, a government agency, designed the stadium’s audio system, which is connected via fiber. The Bird’s Nest is, of course, only part of the story. All told, the Beijing Olympics were held in 31 different venues—indoor and outdoor stadia, bicycle courses, gymnasiums, and fields—some of which existed before the Games. Most are new, however, and many of them, such as the Beijing University of Technology Gymnasium, the National Aquatics Center, and the National Indoor Stadium will remain as fixtures on the Beijing cityscape. A mixed group of systems integrators—often the exclusive Chinese dealer for a specific manufacturer— won bids for these venues’ audio, stage lighting, and control systems. All swimming and diving events took place at the striking National Aquatics Center, better known as the Water Cube for its right angles and for the illuminated air cushions that cover its membrane structure. The building has been lauded for its ‘green’ design—it’s designed to recycle thousands of tons of water a year. Similarly modern is its sound reinforcement system, which was designed by Advanced Communication Equipment Company (ACE). The ‘Water Cube’, otherwise known as China’s National Aquatics Center, featured an extensive installation by Harman Pro dealer ACE. London BLU-80 devices, handles digital signal processing duties, and Soundcraft Vi6 board in the main control room, right at poolside, outputs audio to a BLU-80 8x8 box that’s sitting in the racks of this control room. This BLU-80 routes signals to the four other BLU-80 devices that are in the amplifier room. The Vi6 console handles channel EQ and master EQ, while the Soundweb London system takes care of the rest of the signal processing, including all delay, crossover, parametric EQ, limiters, and matrix mixing to determine which signals and signal groups are routed to which set of speakers within the Center. To ensure that no messaging is lost, the BLU-80 boxes are connected via both CobraNet and analog runs—just in case one connection type fails. The Soundweb London boxes also process signals that are routed to the venue’s underwater sound reinforcement system based on EV speakers. This is strictly for synchronized swimming competitions, so that the athletes can hear their music underwater. For the spectators, JBL loudspeakers provide announcements, national anthems, and other music. All told, ACE installed 16 JBL 2380A horns, 12 AC2212/95 two-way loudspeakers, 52 PD5212/64 two-way loudspeakers, and eight PD5122 low-frequency loudspeakers. For power amplification, ACE chose 39 CTS series Crown amplifiers; IQ3PIPLITE modules allow these boxes to be connected to the CobraNet system via Ethernet. In addition to the Water Cube, ACE also integrated Harman systems at the existing Fengtai Sports Center Softball Field, the National Stadium (Crown amplifiers and the JBL speakers), and the Olympic Sports Center Gymnasium (a handball venue). The company also provided systems to other venues outside of Beijing, such as the Shatin Equestrian Venue in Hong Kong, where ACE has its main offices. In fact, ACE was responsible for the sound reinforcement at so many locations that during competitions, the company kept 80-90 of its 300- plus employees waiting in cars outside different venues in case something went wrong. Why the waiting in cars? Simple. The security in Beijing was so tight that only a couple of engineers are allowed on-site at any one time. The Beijing Institute of Technology’s existing gymnasium served as the venue for the Games’ volleyball competition. Shenzhen-based Sanecore Audio bid for and won the contract for the stage lighting, audio, and intelligent control systems for this arena. Sanecore specified and installed 70 of Community’s R series speakers. “Its dispersion angle is very accurate,” says Jun Zhu, Domestic Sales Manager with Sanecore. Zhu also lauds the series’ high sensitivity and high SPL, and its price/performance value. According to Sanecore, vocal intelligibility and the clarity of security-related messaging were two of the company’s prime considerations when it came to designing and installing the system. Maximum SPL was set at 105dB during games, but rises to 110dB in the case of an emergency. For amplifiers, however, Sanecore specified a variety of manufacturers’ gear. For the Institute of Technology gym, it chose 33 QSC units, while for other venues, it specified brands such as Powersoft and Crest. Symetrix Symnet boxes—some 13 of them—form the control infrastructure of the gym’s audio system, which is connected via Ethernet. Sanecore outfitted the volleyball venue with 27 microphones from Audix and Shure, while two Allen & Heath GL3800 analog consoles drive the system. For his part, Zhu of Sanecore stresses that although his company is a member of the Chinese Acoustic Committee and the Chinese Electronic Products Society, these contacts helped only inasmuch as they provided the firm with information about the industry. “We got these stadia by official and normal bidding, not by having any relationship with any organization,” he says of the Beijing Institute of Technology Stadium and other venues peripheral to the Olympics. One relatively sure-fire way for a manufacturer to get gear into an Olympic venue is to donate a system, either wholly or partially. ACE did not have to give away gear to land the Water Cube contract, however. “We installed the system obviously at a good price, a good package for the customer,” says McKinney. Panasonic, on the other hand, has long embraced the role of sponsor, having supplied broadcasting equipment and maintenance support at every Games since 1992. For the Beijing Games, Panasonic was at the highest level of Olympic sponsorship. In a sign of the AV times, as well as hundreds of piece of broadcast gear, Panasonic provided 25 Astrovision LED screens for 18 venues—a total of 1290.6 square meters of screen area. The company also supplied 265 pieces of RAMSA audio gear. 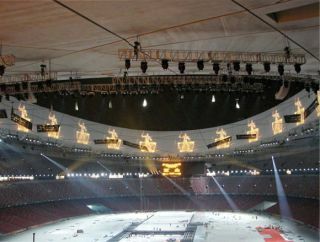 At venues throughout Beijing, Panasonic also supplied a total of about 10,000 HDTV sets and 2,000 CCTV cameras. The sheer magnitude of the gear package from Panasonic alone bears testimony to the unique scale of the Olympics as an event, and the massive audiovisual demands that result—even if the way in which those demands were met wasn’t always commercially orthodox. Trevor Boyer (trevor.boyer@gmail.com) is a freelance writer based in New York.